Preparing for a new set of classes each semester can be stressful, especially when you begin learning new skills in a subject you aren’t familiar with. 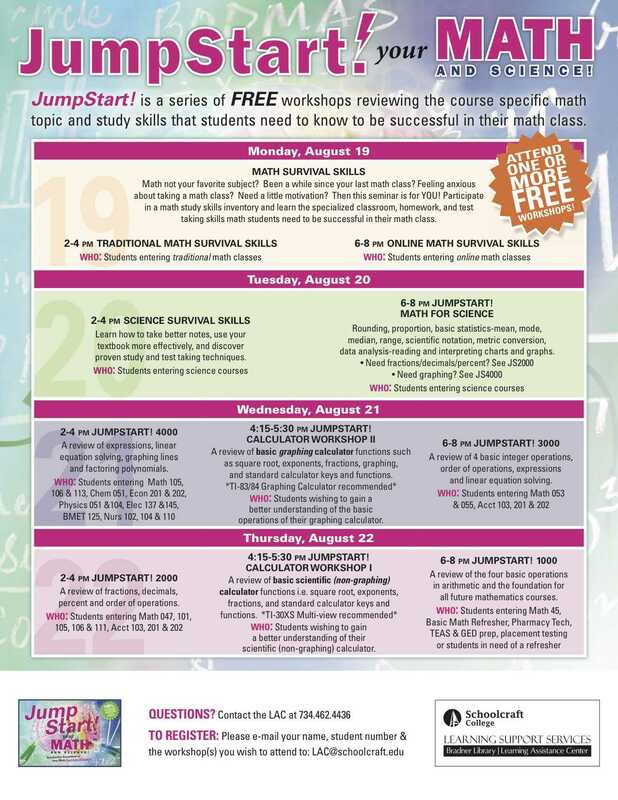 From August 19th to the 22nd, the Learning Assistance Center (LAC) will be providing an opportunity for students to jumpstart their brain into the coming school year, completely free of charge. For five semesters now, the LAC has been offering various workshops aimed at assisting students in both math and science classes with a series of seminars implementing various ‘survival skills’ for a variety of courses. Some of these survival skills include proper note taking, better study habits, test taking tips, and enhanced practices to get the most out of your textbooks. These workshops are designed to be informative and fun. The seminars will run from 2 pm until 8pm in the McDowell Center room 200. For a complete listing of workshops offered or to register, email the LAC at LAC@schoolcraft.com and include your name, student number, and the workshop that you are interested in attending. For additional information contact the LAC 734-462-4436.